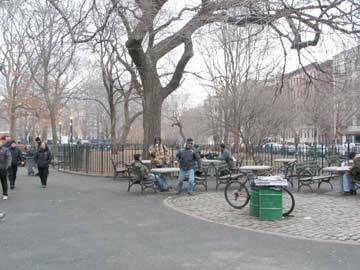 Tompkins Square Park, a green oasis in the East Village between East 7th and East 10th Streets and Avenues A and B, has always been an open space in this part of the city. It had previously been swamps and marshland until NYC acquired it in 1835 and set about landscaping it and planting shade trees with the aim of making it a lage market and what was then the northeast limit of the city. By 1866 the plans had changed and the square was turned into a parade ground for the NY Seventh Regiment, and most of the trees were cut down. 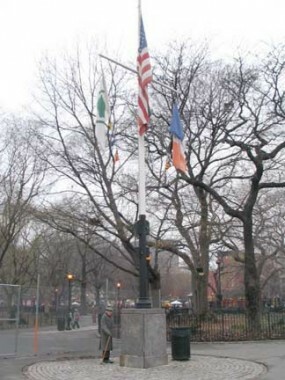 Finally, however, the NY State Legislature settled upon a plan to turn the square, which had been named for NYS Governor and Vice-President under James Monroe, Daniel Tompkins (1774-1825), into a public park; trees were replanted, and twisting public paths were installed. 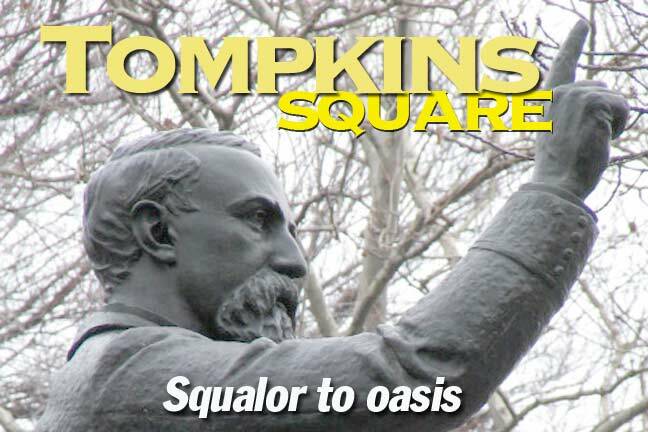 Like Union Square, Tompkins Square became a gathering place over the decades for New Yorkers to give voice to complaints about the economy, various wars, and neighborhood conditions. 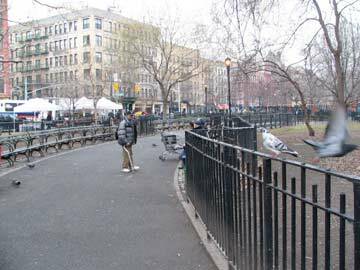 By the 1980s the East Village had, by most accounts, become a dangerous slum and Tompkins Square Park had largely become the province of drug dealers and homeless. 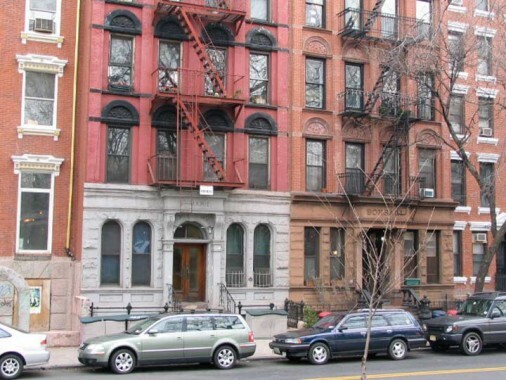 In 1986-87, the conversion of the Christadora House, adjoining the park at 147 Avenue B and East 9th Street to condominiums (it previously had been a settlement house till just after World War II, and used by community groups thereafter) was opposed by many neighborhood residents who feared gentrification and rising rents. The police charged a crowd of protesters, and a riot ensued. Bystanders, activists, police officers, neighborhood residents and journalists were caught up in the violence. Despite a brief lull in the fighting, the melee continued until 6 a.m. the next day. Mayor Ed Koch temporarily rescinded the curfew. The neighborhood, previously divided over how to deal with the park, was unanimous in its condemnation of the heavy-handed actions of the police. Read a personal account of the riot by “Low-Life” author Luc Sante. Today, arguments about the gentrification of Manhattan seem almost quaint, as almost all of the island has been priced out of range for all but the wealthy. Safer parks are one perquisite of the overall conversion of Manhattan. This January day was bleak but mild, so cloudy that the park lights were turned on all day. This was the Day of Mulchfest, where people bring in their dead Christmas trees for recycling. The configuation of the park was redone during 1991, when the park was closed for a few months. 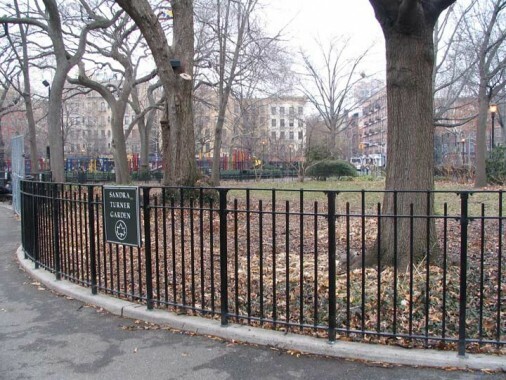 Sandra Turner was the founder of the East Village Parks Conservancy. Here is the garden in season. 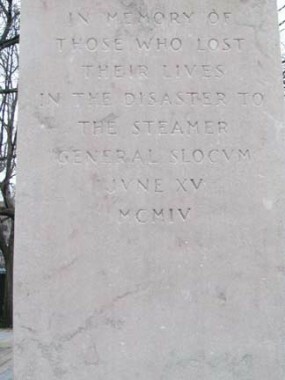 In 1906, a 9-foot tall monument to the victims of the June 15, 1904 General Slocum steamboat disaster in which 1,000 pople perished due to gross negligence on the part of the boat operators was erected in Tompkins Square Park: a small 9-ft. stele made of pink Tennesee marble, featuring a relief picturing two children looking seaward, sculpted by Bruno Louis Zimm. 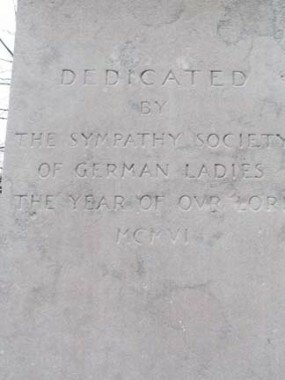 Funds were provided by the Sympathy Society of German Ladies. 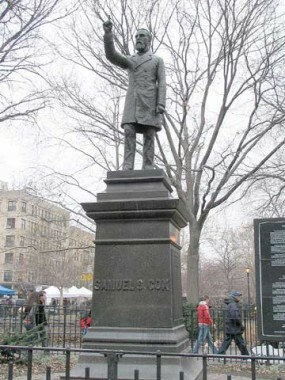 In 1991, it was restored by the NYC Parks Department with funds from SUNY-Maritime College in Throgs Neck, Bronx. 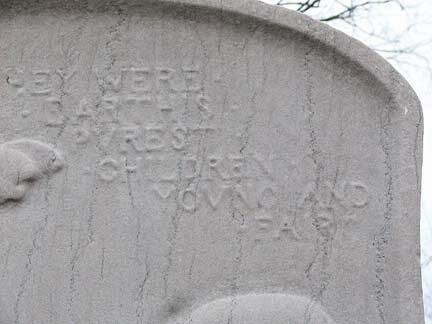 The children are described: “They were earth’s purest, children young and fair.” A larger monument can be found in Lutheran All-Faiths Cemetery in Maspeth, Queens. 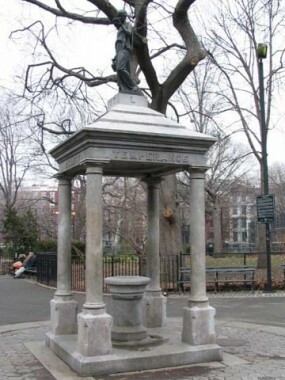 The Tompkins Square Temperance Monument, erected in 1891, was a gift from a San Francisco dentist and temperance activist, Henry Cogswell (1820-1900). His successful practice, and fortunate real estate investments, allowed him to retire at age 36, having amassed a fortune of $2 million…perhaps Gates or Bloomberg money if he lived today. In the late 19th and early 20th Centuries, temperance movements in which people gave up drinking were prevalent (enough so that the US Congress adopted Prohibition from 1919 to 1932, and Russia, Iceland, Norway, Hungary and Finland adopted similar laws in the same time period). 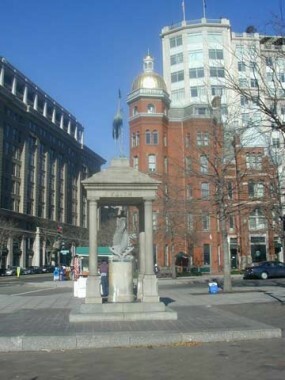 Cogswell became a philanthopist with his chief interest being prohibiting liquor consumption, and so sponsored this monument and fountain. The goddess on the top is the little-known Hebe (pronounced ee-bee) the gods’ cupbearer on Mount Olympus, and one of Heracles (or Hercules’) many ‘conquests.’ The statue was originally forged by Jordan Mott Works, the iron works that gave Mott Haven, Bronx, its name; this is a bronze replica installed in a 1992 renovation. 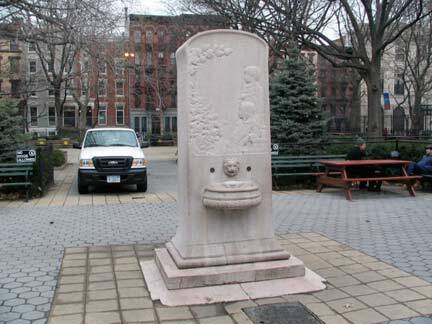 In 2003 I was staggering down Pennsylvania Avenue in Washington, DC one morning when I spotted a monument at its intersection with 7th Street and Indiana Avenue, within sight of the White House, that greatly resembled the Tompkins Square monument. 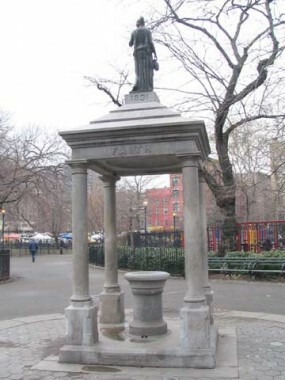 There are subtle differences; note the stork on top, replacing Hebe, and the pedestal is occupied by a big fish; it’s empty in Tompkins Square Park. Other Cogswell fountains in Buffalo, Rochester, San Francisco, and Pawtucket, RI have been torn down. Samuel Sullivan Cox was a Congressman, first from Ohio, then from New York. 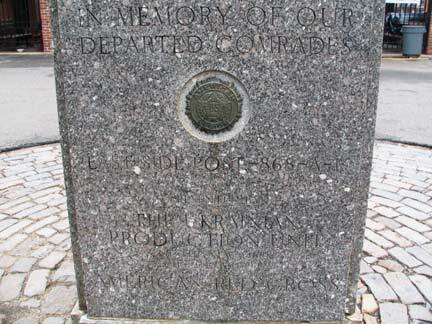 He sponsored Coast Guard and postal regulation giving letter carriers a raise in salary and vacations with pay, winning him the appellation “the postman’s friend.” He was also a backer of the organization that evolved into the US Coast Guard. 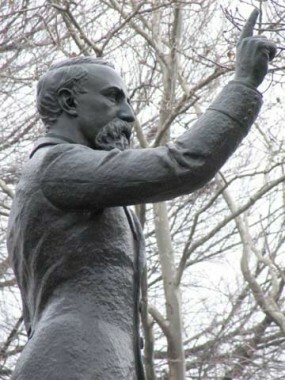 The postal workers of the U.S. sponsored Cox’ statue in 1891; Louise Lawson may have been the first woman sculptor to receive a public commission. 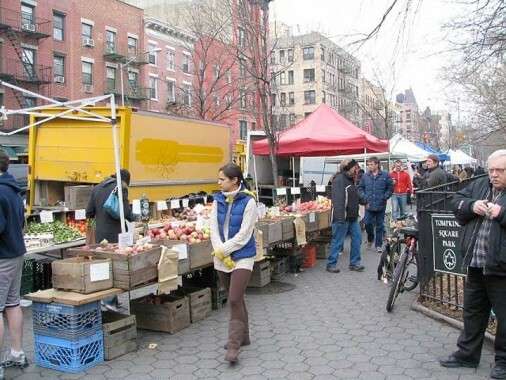 Tompkins Square Park, in the middle of East Village, hosts this Sunday Greenmarket in its southwest corner. Some of the same farms that sell at Union Square appear here: DiPaola Turkey Farms, Sprout Creek Farm, Conuco Farm, and Fantasy Fruit Farm all have stands. [Food Section] The market is on the Avenue A side. Graffiti artists Dr. Revolt and Zephyr painted a mural honoring Joe Strummer, co-founder of the British band The Clash, who enjoyed his NYC visits. The mural can be found on the SE corner of Avenue A and East 7th Street, facing the Cox statue. 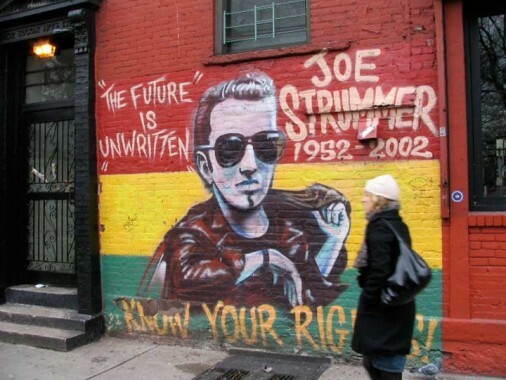 “The Future Is Unwritten” became the title of Julien Temple’s 2007Strummer biopic. The creation of the mural is shown in the video for Joe Strummer and the Mescaleros’ cover of Bob Marley’s Redemption Song. Photographed January 2008; page completed March 30. I am really enjoying your tours of different parts of the city. 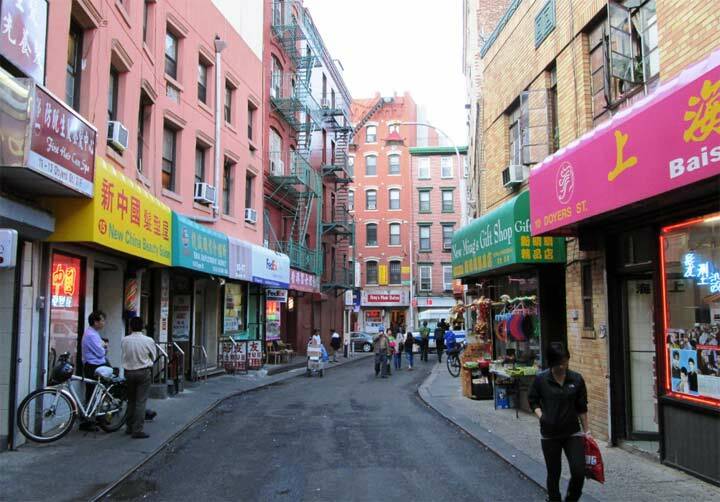 I was born and lived briefly on the Lower East Side and grew up in Rosedale, Queens. I happened upon your site while looking for a photo of the SAS building and Logo off of Van Wyck Expressway. I remember always looking at it as we passed on our way into Manhattan, to visit my grandparents, from Rosedale. I would like to use the photo as part of my blog entry on the Side Angle Side congruency postulate. 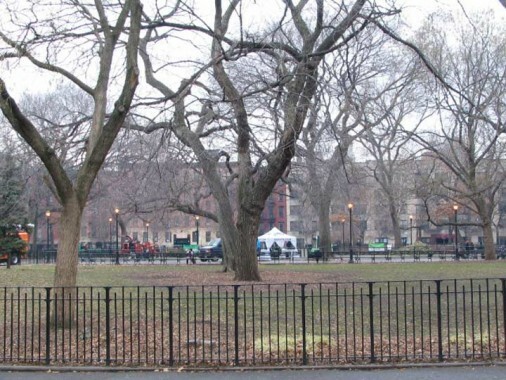 In the late 1960’s and 70’s I played a lot of basketball in Tompkins Square park. During that time the eastern European grandparents from the neighborhood used to sit on the benches and talk.